Food trucks are all the rage. They’re popping up everywhere, embodying the principles of not only fine dining, but fine design on the go. There are food truck lunch breaks, food truck festivals, even food truck weddings. And now food trucks are teaching us a thing or two about social media. 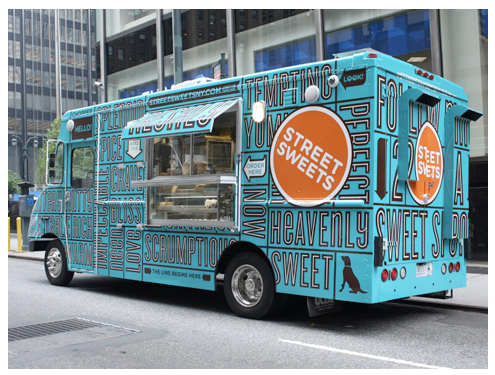 This weekend I came across a must-read article: 6 THINGS FOOD TRUCKS CAN TEACH US ABOUT SOCIAL MEDIA. Consider it an essential Monday morning read. Not only will it get your wheels turning, it may get your stomach rumbling, too. Growing Pains (and Pins): Should Brands Be On Pinterest? The above are REAL statements I have come across online or have heard in conversation relating to brands on Pinterest. Let me be the first to say: Ick. Ick. And ick. We’ve recently had a bit of casual BOF banter about whether Pinterest is a good forum for brand participation. The reviews have been mixed to say the least. Upon floating the question to the Twittersphere, feedback (mostly from kindred spirits in the marketing world) has been surprisingly split. Some feel it’s a great space for self-promotion, while others expressed that they feel it is a sacred space and marketers shouldn’t muddy the water. As an early adopter of Pinterest, I appreciated that, until recently, it was a relatively marketing-free space. It felt pure and untainted. For me there was a rare sense of communal credibility in knowing the things people pinned were shared because they truly enjoyed and believed in them. NOT because they were trying to convince me to buy a $500 pair of leggings or a $70,000 car. While I recognize it is within a brand’s right to play in the space, it leaves me with the same “ugh” feeling I experienced the first time I came across a T.G.I. Fridays in Europe. Sure, you can be there, but should you be? THE GOOD It’s not all doom and gloom for brands on Pinterest. I recently spoke with our friend Ryan Morgan, Director of Marketing at Jeni’s Splendid Ice Creams, and he redeemed my faith in brands on Pinterest a bit. Jeni’s is using Pinterest to give their fans and advocates VIP access to the brand.. Pinterest feels like a natural space for Jeni’s in my opinion. They’re not forcing their way into their fans’ lives, they’re inviting them behind the scenes and into their test kitchen. And that, if you’ll pardon the pun, is pretty cool. So. What say you? Do brands belong on Pinterest? Is it an appropriate space to self-promote or should brands trust their fans to advocate for them in an organic, authentic way? Does it bother you to see brands working their way onto the pinboards you follow? And do you know of any brands that are doing Pinterest really well? Or no so well? Evelina Children’s Hospital was the first new children’s hospital to be built in London in more than a century. The hospital was designed with a goal of “making a hospital that didn’t feel like a hospital.” Accomplishing this required hospital designers and staff to create a patient experience that included touchpoints fostering a sense of inspiration and wonder – in addition to healing - for children throughout their stay. Perhaps the most remarkable touch point of all comes from an unexpected source: the hospital window washers. As part of their contract, Evelina requires that hospital window washers dress up as superheroes while cleaning the hospital windows. Bedridden, sick children delight in seeing Superman, Spiderman and Batman dagling just beyondf the glass. The window washers report the superhero visits to Evelina are the highlight of their week. Touchpoints matter. To your customers. To your staff. To your brand. If you have been living under a rock, you may have missed the memo that Facebook is rolling out new and improved Facebook Insight/analytics. They’re doing away with some of the old metrics, and adding some new (presumably helpful) ones. The official transition goes into effect on December 15. As I re-worked a metrics spreadsheet for a client yesterday, I couldn’t help but think of something we often talk about at Brains on Fire. Today seems like the perfect opportunity to pass it on. Let’s take a mental vacation for a second. You’re finally taking the trip to Paris you always dreamed of. After a delicious French meal, you return to the hotel room to find your bags have been stolen. No more Euros. No more credit cards. No more passport. After battling the language barrier with a French police officer, you head to the American Embassy for help. Although you’re on foreign soil, as soon as you walk through the door, you’ve found your home away from home. Embassies are an established presence where interactions, conversations and participation are facilitated by one or more ambassadors. For this next part, let’s pretend you own a pixie dust store (aptly named The Pixie Dust Store), and your brand site lives at pixiedust.com. Let’s talk home turf. Think of pixiedust.com as owned real estate. It belongs to you. You have control of the conversation. You decide when to blog or post a photo. You decide how posting a blog of photo will be done. You can change the site design. You make the rules. It’s a space The Pixie Dust Store controls. Why are owned properties important? Why are rented properties important? Don’t get us wrong. Rented properties are great way to connect. Though you may not have all the control, they provide an opening in the conversation to reach out to people beyond your owned “home turf” and become a part of their existing conversations. Back to the embassy metaphor! Both owned and rented properties are valuable. Each one packs a unique set of benefits and challenges. Your owned property (pixiedust.com) is America. It’s your home base. Your motherland. Think of the footprints you create in rented spaces (like Facebook, Twitter) as your little embassies. Just like the American embassy in France, you may not make the law of the land, but in that little space, you can represent what you stand for. And you can become a welcoming space for others in that rented space to join you. http://vimeo.com/11527784 Confession: I really like Twitter bios. In only a couple sentences, I am able to weed the “cake people” from the “pie people,” and the “cat people” from the “dog people.” In one little paragraph, I have learned that the head of a rather large public relations firm considers himself a french fry fanatic, and the CEO of a big brand is a self-professed “pencil person.” When it comes to Twitter bios, there seems to be something about the limited character space compels people to put a stake in the ground, make a personal declaration and swiftly self-identify. But what is identity, really? How would you define it? One dictionary suggests it is simply “knowledge of who one is.” Whether you’re a brand or simply a human being, it’s an important question to ask yourself – and an even more important question to answer. Why? Because the answer helps us connect to our kindred spirits, our passion and our purpose in this world. Fill in the blank: I am a ______________. A mac? A PC? A card-carrying member of the NRA? Buddhist? Vegetarian? What would you fill in that blank with? Whatever it is, it’s part of your identity. It’s a label. It’s something with which you identify and something you support. And most important, it’s a part of you. As humans, we are fundamentally hardwired to desire to be a part of something bigger than ourselves, more important than we are alone. Religion, sports teams – even brands. We’re always on the lookout for things that we can incorporate into our personalities – because it creates a sense of belonging. And we all want to belong. Powerful identities help draw kindred spirits to you and give them a badge of honor to wear. It allows you to recognize others in the movement, be able to share their stories, and both with like-minded people. It’s an extremely powerful tool, considering that we spend much of our lives being identified by what people call us. Getting a chance to say, “This is who I am in spite of what everybody things” in an authentic way can be a really exciting moment for someone. Joining a movement is a chance to take control of your identity rather than falling victim to someone else’s labeling. Me? I am a sister, a daughter, a dog person. A BOF-er and a displaced Midwesterner. A Buckeye. A first-born ENFP. I am a Catholic, a former Texan and a part-time vegetarian. I’m a writer, a Honda driver, an optimist and a life enthusiast. I’m a Googler, a storyteller, a dreamer and a pixie dust sneezer. I am a hopeless romantic, an iPhone-user and a lover of Sharpies. "A community needs a soul if it is to become a true home for human beings. You, the people, must get it this soul." | Pope John Paul II Once in awhile you come across an unexpected story that really puts everything in perspective. I had one such experience last week when I clicked the link to a video titled "Peanut Butter Pie for Mikey." After Jennifer Perillo lost her husband of 18 years to a sudden heart attack, she made one simple request: that those wishing to celebrate her husband's life make a Peanut Butter Pie (his favorite) and then share it with those they love. From Jennifer's blog: "As I spend Friday reflecting on the love and life that was gone in an instant, I'd like to invite all of you to celebrate his life too. Mikey loved peanut butter cream pie. I haven't made it in a while, and I've had it on my to-do list for a while now.Â I kept telling myself I would make it for him tomorrow. Time has suddenly stood still, though, and I'm waiting to wake up and learn to live a new kind of normal. For those asking what they can do to help my healing process, make a peanut butter pie this Friday and share it with someone you love. Then hug them like there's no tomorrow because today is the only guarantee we can count on." Just spoke to the GM at @BlueSmokeNYC and they only had one slice of #apieformikey left at the end of the evening. How awesome is that? I didn't blog it, but I did make #apieformikey, and I shared it with the people I love. Just made #apieformikey after reading the very sad story. It's date night tonight, and I'm feeling very appreciative of what I have. See how Yvette in San Juan adapted my #apieformikey cupcake recipe. Love is an international language! My friend made the pie and printed Jennies post to hand out at her dinner. #apieformikey is impacting lives. I just found out some of the students on campus have even been baking #apieformikey . After discovering the video, I spent a couple hours exploring hashtag #APieForMikey on Twitter. It introduced me to people from all walks of lifeÂ around the country (and world) sharing their own stories of love, loss and life celebration. People brought together by a tragic loss, a simple request and a social medium - in order to feel and heal together. Strangers surrounding one grieving family, lifting them up with love. Take a few minutes to watch the video, and then go forth into your week. Whether you bake a peanut butter pie for Mikey, or just share a few minutes of conversation with a colleague over a peanut butter and jelly sandwich - be thankful for this day, and the communities you are a part of. SHARE | How has social media (or the relationships you nurture through social media) impacted your "real" life? I collect antique photographs. Old photos of strangers I have never met and have no familial ties to. I know nothing about their pasts. I don’t know their names or where they grew up. I can’t tell you their favorite foods or where they were born or buried. Despite the abundance of question marks punctuating their lives and stories, however, each photograph offers a doorway to the past; a split-second time warp, capturing a moment I wasn’t there to experience, but somehow feel connected to. This weekend I watched NYC fireworks sitting atop the roof of a yellow taxicab. I met a pair of superhero dogs, dressed in patriotic superhero dog capes. I took a wild and windy ride on the back of a motorcycle. I cheered when a friend got engaged. I wasn’t really there for any of it, but somehow I felt a part of it. All thanks to Instagram. I recently stumbled across a blog post declaring Instagram “The Most Important Social Network I’ve Ever Used.” As a newbie to the iPhone world, it seemed like a grandiose and sweeping statement. Can a wordless social medium really connect people and start a conversation? And what, exactly, is the power of a picture? Instagram (and photosharing) not only provide us with new and instantaneous ways to capture and preserve our stories and moments, they offer an outlet to illustrate our stories, too. We are creating social scrapbooks, and each photo has the potential to ignite sentiment, stories and conversation between the photographer and the viewer. SoÂ what do we gain by tapping into our inner instartist? Some people suggest these apps are creativity and conversation catalysts with the power change the way we approach our everyday lives and world. It's Tuesday. It feels like Monday. Most of us are back to work after a long (and hopefully happy) holiday weekend. We woke up this morning and went through the same routine we do each day of the week. We took the same route to work to return to the same office we inhabit 40+ hours a week. But somewhere along the way, I imagine we all bypassed something beautiful. Maybe it's time to start seeing our same world differently. Today I'm challenging each of you to look at your day. Don't just look at it - really see it. And when you do, snap a picture and send it to me amy@brainsonfire.com. Let's practice the art of silent storytelling through the power of pictures. A couple weeks ago a few of us were discussing the somewhat unfortunate relationship between airlines and social media. If you don’t know what I’m talking about, go ahead and do a quick Twitter search for “airline” and you’re guaranteed to find a plethora of complaints. “They lost my bag” complaint. “We’re still sitting on the runway” complaint. “Why can’t the plane take off with a crack in the windshield?" complaint. “How can adult humans take so long deboarding an airplane” complaint. “I don’t like peanut smell” complaint. “How dare you bring a baby on an airplane!” complaint. I admit it. In a moment (possibly multiple moments) of frustration, I too have turned to tweeting. And while I feel justified in doing so, (we were told our plane was held for over an hour “waiting on bags from a previous flight” as we peeked out the window to discover the baggage handler taking a nap on the bag trolley...) the airlines seem to take a particularly harsh 140-character flogging on a regular basis. Perhaps it’s just the nature of a high-stress experience (travel) combined with the instantaneous gratification that comes along with unloading that stress on the world with the push of the button. Who can say? But one thing is certain: travel brings out a side of many people you (thankfully) don’t see in everyday life. Precisely why I was extra delighted to stumble across the new preflight video for Virgin America (in partnership with Method Products whose hand wash takes up residence in Virgin America restrooms). This video does everything right. It appeals to travelers of (all types) by embracing reality (of all types). It uses humor to boost customer morale. It creates a sense of oneness amongst strangers, if only from wheels-up to wheels-down. Research has shown that laughter, among other things, lowers blood pressure, increases teamwork and helps people feel more in control of their situations, even if those situations seem out of control. In fact, even if you don’t get a giggle out of someone, the simple anticipation of a positive, humorous laughter experience has been shown to reduce stress hormones. Virgin Airlines (and Method, too) deserves a pat on the back (and perhaps some love tweets) for displaying such an evolved sense of self awareness. There are always going to be flight delays. Luggage will get lost. People are going to be annoying. They might even kick the back of your seat. But we’re all in this together. And with a dash of good-natured humor, one simple, powerful message (and a catchy tune that doesn't hurt, either) they create an insta-community at 20,000 feet - from New York to Los Angeles, Houston to St. Paul. One of the most important lessons I ever learned about brand loyalty I owe entirely to the 80s. But before we time warp back to a decade when Popples, Giggles and school photos with laser-light backgrounds reigned supreme, let’s first journey back a mere 12 hours. Think back to last night. That whole comfy pants, lounging around unwinding from a long day, channeling surfing while surfing the web all at the same time (don’t deny...) scene. Do you remember any of the commercials you saw on television? Did any of them inspire you to care about a brand? Even if you can name a couple of the brands featured in the commercials, will you remember or care about them in a decade or two? That wasn’t even twelve hours ago, but I’m willing to bet I can take you back 20-some years with the help of one video (and a brand) you’ve never forgotten. But first, let me set the scene. Allow your mind wander back to the days when t-shirt clips, bubble necklaces, jelly shoes and Reebok pumps meant you were fashionable. A time when every kid wanted “Pillow People” on their bed, New Kids on the Block in their boombox, a Lisa Frank Trapper Keeper in their desk - and we all envied the kid with the Snoopy Sno-Cone Machine. Like most kids of my generation, my first inklings of brand loyalty were born in my living room. It all began sitting on the floor in front of an episode of Mister Rogers. I was never one to just sit and watch TV, it was mostly just filler background noise while I did something more important - like drawing. So there I was, dipping my hand in and out of a plastic bucket full of colorful wax nubs in varying sizes (with the exception of white, which was mostly intact, because, let’s be honest, it was the most useless crayon ever invented - except during Halloween, aka: “black construction paper season.”) Life was good - and it was about to get even better. Though there seems to be a bit of debate amongst Gen-X and Gen-Yers about exactly who took us there first (Was it Sesame Street? Mister Rogers? ), you’d be hard-pressed to find one of us who doesn’t clearly recall the magical moment we were transported from the Crayola box to the Crayola factory. Sure, there are some who might contest it was nothing more than one of the craftiest product placements to ever capture the minds, hearts and loyalties of young audiences. I, on the other hand, believe Crayola simply opened the kimono (and their doors) to welcome an entire generation of children to not only use their product, but also become part of the magic. Stonyfield Farms: Once upon a time, I didn’t know (or particularly care) where my yogurt came from. It was just something to get me through breakfast. Then along came Stonyfield Farms. A couple clicks into the series of videos featuring family farmers who provide milk for Stonyfield products, and suddenly I'm a yogurt passionista. I now not only know where my yogurt comes from, I know who it comes from. I know its story from farm to fridge. I have a vested interest in the success of their farmers, and every time I find myself standing in the dairy aisle reaching for Stonyfield, I feel like I’m making an investment in those families and their story – one spoonful at a time. Jeni’s Ice Cream: As a former Columbus, Ohio resident, I’m certainly not impartial when it comes to ice cream. Jeni’s Splendid Ice Creams (pardon the pun) takes the cake. And while the product itself is – as the name suggests – truly splendid, it was their honest, transparent, passionate approach that stole my heart.Â Jeni’s blog provides a glimpse behind the scenes of this Columbus staple, welcoming Jeni’s fans to the table to experience the food, friends and farms that come together to make Jeni’s so gosh darn splendid. Burts Bees: I love just about everything about Burt’s Bees. Their products, their philosophy , their philanthropic spirit. As a result, I have a bit of a brand crush (my bathroom cabinet can testify.) I was particularly delighted to discover that they’re now featuring employee spotlights on YouTube. The videos offer a glimpse at into the lives, jobs and passions of people at all levels in the BB hive, giving fans a chance to meet the people who make the products – and company – exceptional. Crayons taking shape in Pennsylvania. Lip balm from North Carolina. Ice Cream from Columbus. Yogurt from family farms around the country. What do they all really have in common? Â They don’t just push their product, service or message into the world of their fans, they open the door and welcome their fans into their world. We can all learn something here. And the lesson is very simple. It's time to open the kimono. That begins by opening your door and inviting people in. It's time to turn your brand's fans into family. Which brands would you add to the list? Who has opened their doors, invited you to experience how they do what they do, shared their magic, introduced you to their people or made you feel like family?